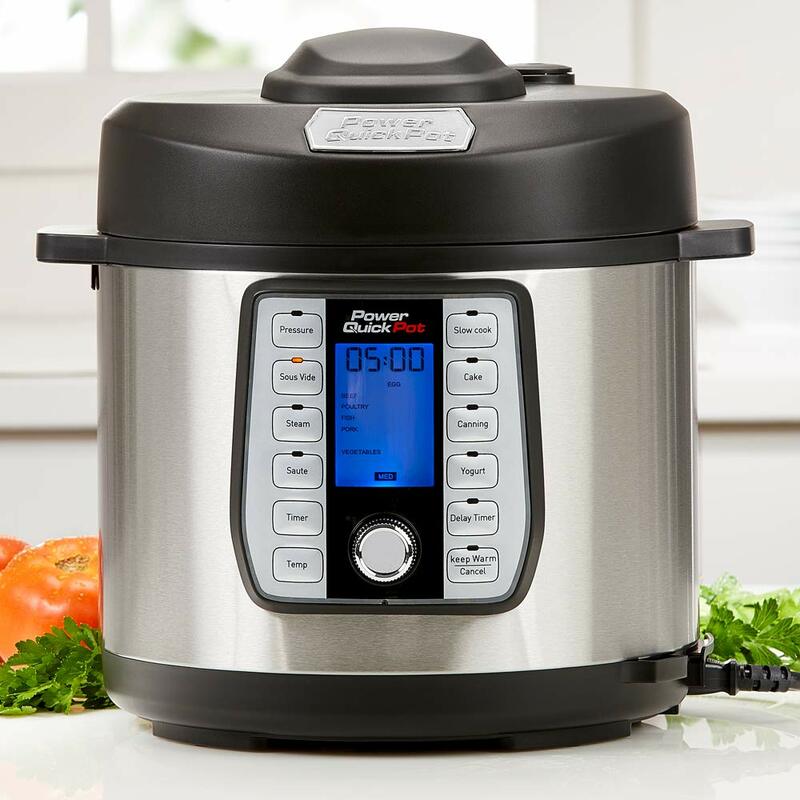 Functions – Power Quick Pot features 37 one-touch cooking functions which also include temperature settings while Instant Pot the DUO model features 26 functions and temperature settings. Safety Lock System – While Instant Pot comes with 10 different safety features, Power Quick Pot features magnetic switch lid lock. 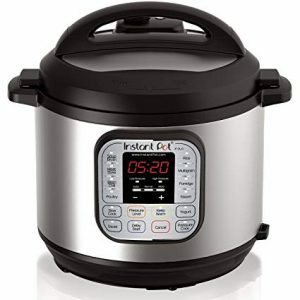 Canning Feature – Instant Pot does not have a Canning feature while Power Quick Pot does. Power Quick Pot is a winner here. Sous Vide Feature – Power Quick Pot features Sous Vide cooking feature which delivers consistent and uniform cooking. LCD Color Display – Power Quick Pot features color changing LCD color display which the Instant Pot lacks. Power Quick Pot and Instant Pot – Stainless Steel, both electric cookers’ cooking pot are made from good-grade 304 stainless steel. Verdict – Power Quick Pot is a winner here. More wattage means your food is cooked relatively in lesser time. But more power also means higher power consumption. Higher wattage Power Quick Pot is more suited if you have to cook food for a bigger family. Does it have time delay function? Does it have “keep warm function”? Does it have a safety lock system? Does it have a Canning feature? Does it have a Yogurt feature? Can I cook with oil in it? Instant Pot – As per the reviews, Instant Pot is a good rice cooker and even saves time in cooking rice. Power Quick Pot – There are not many reviews which can confirm if Power Quick Pot is a good rice cooker but it does claim to make rice. A few reviews claim that the rice is crunchy and always stick to the side and bottom. Does it make meat tender? Power Quick Pot – It infuses meat with intense flavor and adds moisture causing your meats to soften for a melt-in-your-mouth texture. Instant Pot – To hasten pressurization when cooking large cuts of meat, allow meat to “rest” at room temperature for 10-15 minutes before cooking. When seasoning with salt, it is better to use less than you might add normally, especially with meats, poultry, and fish. Use salt to taste after cooking. Thinner cuts of meat will cook faster. Instant Pot – There is no baking mode but you can still use it to make soft, warm bread. It can steam cook quick breads by pressure cooking them and help yeast breads rise at a record pace. Does it make good yogurt? Instant Pot – It is a bit hard to make yogurt without a yogurt button on a pressure cooker, but it is possible. Once your milk has reached 108 degrees stir starter yogurt and whisk until incorporated. Put inner pot back in Instant Pot and place lid on pressure cooker. Does it show time left? 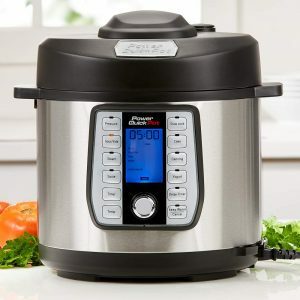 Instant Pot – Nope it does not, it shows the time required for cooking the dish and when the countdown is finished it just beeps. Power Quick Pot – No, press the cancel button on the control panel and unplug the power cord from the wall outlet and the unit base. Instant Pot – YES, you can cook dried beans without soaking first. It is as simple as putting 1 pound dried beans with 6- 8 cups water in your Instant Pot and cooking on high pressure for 30 minutes. Does it work as a slow cooker? Instant Pot – It also derives its heat from the bottom, but the thin metal pot that it uses does not have the same heating effect as that of a slow cooker. Instant Pot – While there is no “preheat” setting on an Instant Pot , you can warm it up before you begin cooking using this hack: Set the device on sauté mode as you prep the meal to get a head start. Press “off” and choose your desired setting when you are ready to get cooking. Power Quick Pot – No, the air tight lid locks steam and flavor inside the pot to cook your food. Instant Pot – Nope, an Instant Pot uses steam pressure to cook food very quickly. Does it automatically release pressure? Power Quick Pot – It retains heat and steam so it won’t escape. Instant Pot – Natural Pressure Release is great for keeping your kitchen nice and clean. Since the pressure is gradually released, there is less movement in the Instant Pot . Your stocks and soups come out cleaner and food is more likely to stay intact. Power Quick Pot – It claims to deliver food’s that’s full of moisture, flavor, and nutrients. Instant Pot – As per the reviews the recipes come out just as good as if you stood over the stove all day long. Does its lid go in dishwasher? Instant Pot – All parts of the Instant Pot with the exception of the cooker base are dishwasher safe. This includes the stainless steel inner pot, the lid, the sealing ring, and the steam rack. Power Quick Pot – No but you can also incorporate the liquid into your meal and benefit from the residual vitamins. Instant Pot – For your Instant Pot to function correctly, you need to put at least 1 cup of liquid into it. (It’s a pressure cooker, so no liquid means no steam, and no steam means no pressure!) If you’re cooking something that you don’t want to keep “dry,” use the metal trivet to elevate it above the water in the bottom of the pot. Loretta Ortega says that the lid does work very well. Lois Hughes writes that it holds a lot of food. Debbie Abbott claims that it steams vegetables very nicely but does not cook meat. Elena Pope says that the inner pot is a very lightweight Teflon coated pot. Belinda Ruiz mentions- “ When I cook rice, I only do two cups at a time and it sounds like a train is coming and spewing water out the top, then rice is crunchy”. Another user, Opal Aguilar says- “Spray the inner liner with cooking spray before making anything or you will have a hard time cleaning the bottom of the inner liner”. Christie Webb claims when she cooked on slow cook, her veggies were still hard. Mary Stevenson states that the food sticks to the “non-stick” coating. Juana Anderson writes- “I feel like this was poorly made. It worked great for about 2 1/2 months and then stopped working well, right after the 90 day warranty expired and there was nothing I could do”. Mindy Cook says that the inside pot, the coating flakes off with use. Cecilia Lambert mentions that it works well for some recipes and awful for others. Victoria Wells claims- “Not as advertised on TV. I made pot roast and roast was like a piece of rubber and the vegetables came out like pulp”. Patty Shelton says- “On television it is deceiving. It makes you think you can throw in everything at once. This is not true”. Another user, Claudia Gregory states- “I made baby back ribs following the recipe and they were not cooked enough”. Emma Graves complains that it takes forever to build up pressure. Alexandra Carr, another user, writes- “After using it one time with a pork roast I found it not very tender”. Francis Fisher mentions- “Most food burnt the bottom of the pot. I even sprayed with non-stick spray but it didn’t make a difference”. Sue Oliver claims that she tried several of the recipes in the book and has found that items don’t cook in the amount of time it says, and she had to reset the pot and add more time. Grace Glover says that the sauté mode is nice and the tall pot keeps the oil from splattering on the top rim. Lila Nunez writes- “Super easy to clean; just throw the stainless steel pan in the dishwasher and easily wipe down the rest with a damp cloth”. Stacy Morton, another user states- “Instant Pot cooked rice better and faster than with my stovetop version”. Mandy Marshall writes- “I wouldn’t recommend cooking pasta in it, as it fills the steam collector quickly and makes a mess”. Jenna Figueroa says that beans are all right, but make sure to have a lot of water to prevent burning the beans. Lola Long, another user claims that the odor stays no matter how well you wash the pot, gasket, and lid. Sheila Burton mentions that the extra parts that are needed are super expensive, and some not available at all for the mini. Holly Franklin says- “The steam release valve seems flimsy, but it does the job. Just be very careful when releasing the steam and don’t put your hand or face anywhere near the top”. Jessica Silva writes- “The cord is a little short, at only 36 inches”. Be the first to comment on "Power Quick Pot vs Instant Pot"